Die Veneris, 6 Augusti, 1641. Custos Regni in King's Absence. Votes affecting Proceedings in Courts. RESOLVED, upon the Question, That Sir Samuel Luke is well elected, as a Burgess for the Town of Bedford; and ought to serve, and to sit, as a Member of this House. Sir Wm. Dalston has Leave to go into the Country. Resolved, &c. That the Election of the Town of Tewksbury is totally void: And that Mr. Speaker shall issue forth his Warrant, to the Clerk of the Crown in Chancery, for a new Writ, for the Electing of Two Burgesses to serve for the said Town of Tewksbury, in this present Parliament. Resolved, &c. That Mr. Perd is well elected, and ought to serve, as a Burgess, for the Town of Barnstaple. 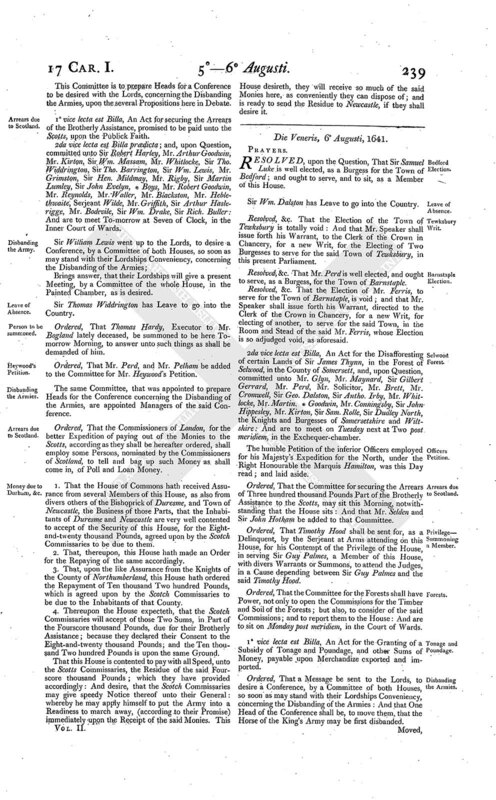 Resolved, &c. That the Election of Mr. Ferris, to serve for the Town of Barnstaple, is void; and that Mr. Speaker shall issue forth his Warrant, directed to the Clerk of the Crown in Chancery, for a new Writ, for electing of another, to serve for the said Town, in the Room and Stead of the said Mr. Ferris, whose Election is so adjudged void, as aforesaid. 2da vice lecta est Billa, An Act for the Disafforesting of certain Lands of Sir James Thynn, in the Forest of Selwood, in the County of Somersett, and, upon Question, committed unto Mr. Glyn, Mr. Maynard, Sir Gilbert Gerrard, Mr. Perd, Mr. Solicitor, Mr. Brett, Mr. Cromwell, Sir Geo. Dalston, Sir Antho. Irby, Mr. Whitlocke, Mr. Martin, * Goodwin, Mr. Conningsby, Sir John Hippesley, Mr. Kirton, Sir Sam. Rolle, Sir Dudley Norththe Knights and Burgesses of Somersetshire and Wiltshire: And are to meet on Tuesday next at Two post meridiem, in the Exchequer-chamber. The humble Petition of the inferior Officers employed for his Majesty's Expedition for the North, under the Right Honourable the Marquis Hamilton, was this Day read; and laid aside. Ordered, That the Committee for securing the Arrears of Three hundred thousand Pounds Part of the Brotherly Assistance to the Scotts, may sit this Morning, notwithstanding that the House sits: And that Mr. Selden and Sir John Hotham be added to that Committee. Ordered, That Timothy Hood shall be sent for, as a Delinquent, by the Serjeant at Arms attending on this House, for his Contempt of the Privilege of the House, in serving Sir Guy Palmes, a Member of this House, with divers Warrants or Summons, to attend the Judges, in a Cause depending between Sir Guy Palmes and the said Timothy Hood. Ordered, That the Committee for the Forests shall have Power, not only to open the Commissions for the Timber and Soil of the Forests; but also, to consider of the said Commissions; and to report them to the House: And are to sit on Monday post meridiem, in the Court of Wards. 1a vice lecta est Billa, An Act for the Granting of a Subsidy of Tonage and Poundage, and other Sums of Money, payable upon Merchandize exported and imported. Ordered, That a Message be sent to the Lords, to desire a Conference, by a Committee of both Houses, so soon as may stand with their Lordships Conveniency, concerning the Disbanding of the Armies: And that One Head of the Conference shall be, to move them, that the Horse of the King's Army may be first disbanded. Moved, That some Course might be taken, that, after they are disbanded, they may march about Six in a Company; and that his Majesty may be moved to issue forth a Proclamation to that Purpose. It was likewise moved, That the Lords be desired, that the English Lords Commissioners may move the Scotts Commissioners, to give it in Writing, under their Hands, that they will, within Forty-eight Hours, after they shall have received the Monies at Newcastle, march away. This Committee is to prepare Heads for a Conference, to be desired with the Lords, concerning the Disbanding of the Armies: And they are to take into Consideration the Propositions and Motions, that have been here in Debate, concerning that Business. The Lords do desire, if it may stand with the Conveniency of this House, that they may have a present free Conference, by a Committee of both Houses, concerning the Soldiers that the Spanish Ambassador desires to have out of Ireland. Answer returned by the same Messengers; that this House has considered of their Lordships Message; and will send Answer, by Messengers of their own, in convenient time. Answer returned by the same Messengers; that this House has taken into Consideration their Lordships Message; and are at this time in Debate of Businesses of great Importance; and therefore will send Answer, by Messengers of their own, with all convenient Speed. That this House shall desire the Lords (according to their former Propositions) that they will join with the House of Commons, to pray his Majesty to appoint a Custos Regni, in his Absence out of the Kingdom. To prepare some Reasons, whereupon this House shall ground their Desire, of again propounding this Desire to the Lords. That ancient and constant Course, from and in all times, has been always, to have a Locum tenens, in the King's Absence (a Parliament then sitting) not limited to any particular Matter. Mr. Hide went to the Lords, to acquaint their Lordships, that this House is resolved to sit this Afternoon; and to desire their Lordships, that they would do the like, if it may stand with their Lordships Conveniency. That Mr. Whitlocke go up to the Lords, to desire them to appoint the Commissioners of England to know of the Scotch Commissioners, what Persons they desire to have named in the Act for the Securing the Remainder of the Brotherly Assistance, to whom the Monies shall be paid; or that shall authorize others, under their Hands and Seals, for Receiving of it: And that they will present the Names of such Persons to the Commissioners of England, to be inserted in the Act. The Lords have sent some of the Lords to attend the King, concerning the general Pardon; and that his Majesty has given Directions for the Preparing of it: And that their Lordships are resolved to sit this Afternoon, at Five of Clock; and desire this House would do the like, if it may stand with their Conveniency. Answer returned, by the same Messengers; that this House takes notice of their Lordships Message; and has considered of it; and are resolved to sit this Afternoon. Ordered, That this Debate, concerning a Custos Regni, shall be resumed the first Business this Afternoon. Mr. Hide brings Answer, that their Lordships will sit this Afternoon at Five of Clock. Sir Hen. Vane went up to the Lords, to acquaint their Lordships, that this House is ready to give their Lordships a Meeting, by a Committee of the whole House, concerning the Matters of the Two last Messages from their Lordships, touching the Soldiers * * out of Ireland, and the Matter of the Treaty. Mr. Lloyd has Leave to go into the Country. The humble Petition of the Right Honourable Mary Lady Petre, Dowager * * of the Right Honourable Robert Lord Petre, was this Day read. Sir Hen. Vane brings Answer, that the Lords are ready, presently, to give a Meeting to both the Conferences. Sir H. Vane, Sir Wm. Armyn, Sir Tho. Barrington, Mr. Fynes, Sir Philip Stapleton, Mr. Martin, Sir John Hotham, Sir John Colpepper, are appointed Managers and Reporters of this Conference. Ordered, That the Committee for Recusants convict shall prepare Heads for a Conference to be desired with the Lords, concerning the Removing of the Lord Petre, a Ward, into the Custody of the Earl of Warwicke: And have Power to send for Parties, Witnesses, Papers, Records; and to examine whether he has been popishly bred, and by whom; and to inquire in like manner after any other Ward, that has been so disposed of. Mr. Pelham is added to this Committee. 2da vice lecta est Billa, An Act for the Sale of the Manor and Farm of Hogstown, for Payment of the Debts of Simon Rowse; and, upon Question, committed unto Sir James Thinne's Committee. ...Gerard, ...Hide...Waller,...Glyn,...Bosevile, Sir Sydney Mountague,...Whistler,...Whitlock, are added to this Committee: And are to meet, upon this Bill, at the same Time and Place as they meet to consider upon the same Bill. Resolved, upon the Question, That no Vote passed at a Committee of this House, and not reported, nor confirmed by the House, shall be any Rule or Direction for any Court of Justice in Westminster-hall to ground any Proceedings upon. Resolved, upon the Question, That the House shall proceed to the Consideration of a Custos Regni, according to the Order of the Day. 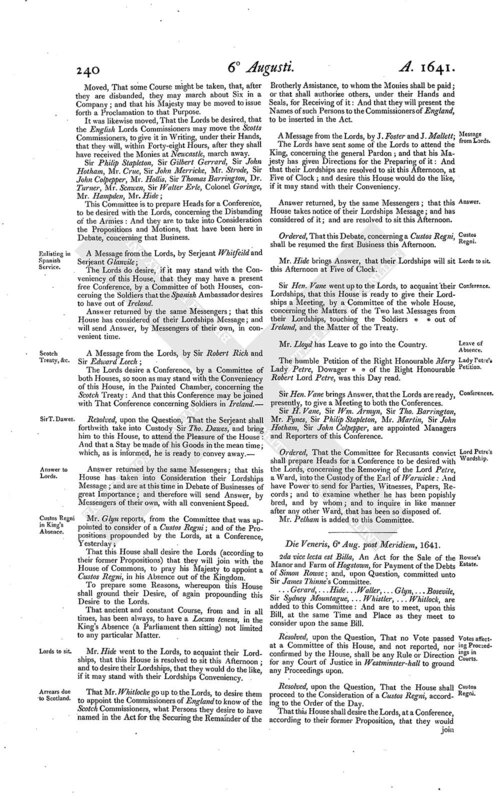 That this House shall desire the Lords, at a Conference, according to their former Proposition, that they would join with the House of Commons, to pray the King, that he would make a Locum tenens, before he go out of this Kingdom: That it has been the common constant Practice of all former Times, that the King should make a Locum tenens, when he goes out of the Kingdom, and that a Parliament is sitting in the King's Absence. Resolved, upon the Question, That the former Votes of this House, concerning the King's appointing a Locum tenens before he go out of the Kingdom, shall, at a Conference, be again insisted upon. Ordered, That the former Committee appointed for this Business shall prepare Reasons, for the Maintenance of this Vote. Ordered, That on Monday Morning next, at Nine of Clock peremptorily, the House shall take into further Consideration the Articles against Mr. Piercy, Mr. Jermyn, &c.; And Mr. Chudley is ordered to attend at the same time. To desire their Lordships to join with this House, that the Horse of the King's Army be first disbanded, and That forthwith. Mr. Green reports from the Committee of the Customers, the Case concerning the Creditors of Sir Tho. Dawes. Resolved, upon the Question, that this Report, now made by Mr. Green, shall be confirmed, in all Particulars, as it is now reported; viz. That the Creditors of Sir Tho. 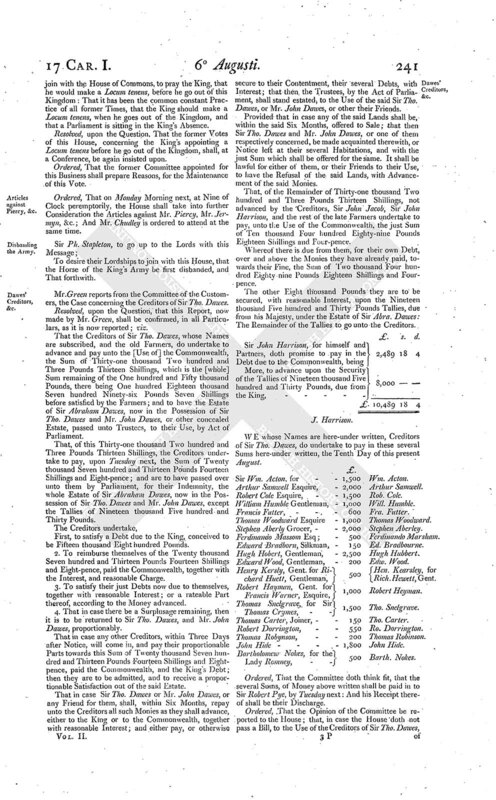 Dawes, whose Names are subscribed, and the old Farmers, do undertake to advance and pay unto the [Use of] the Commonwealth, the Sum of Thirty-one thousand Two hundred and Three Pounds Thirteen Shillings, which is the [whole] Sum remaining of the One hundred and Fifty thousand Pounds, there being One hundred Eighteen thousand Seven hundred Ninety-six Pounds Seven Shillings before satisfied by the Farmers; and to have the Estate of Sir Abraham Dawes, now in the Possession of Sir Tho. Dawes and Mr. John Dawes, or other concealed Estate, passed unto Trustees, to their Use, by Act of Parliament. That, of this Thirty-one thousand Two hundred and Three Pounds Thirteen Shillings, the Creditors undertake to pay, upon Tuesday next, the Sum of Twenty thousand Seven hundred and Thirteen Pounds Fourteen Shillings and Eight-pence; and are to have passed over unto them by Parliament, for their Indemnity, the whole Estate of Sir Abraham Dawes, now in the Possession of Sir Tho. Dawes and Mr. John Dawes, except the Tallies of Nineteen thousand Five hundred and Thirty Pounds. First, to satisfy a Debt due to the King, conceived to be Fifteen thousand Eight hundred Pounds. 2. To reimburse themselves of the Twenty thousand Seven hundred and Thirteen Pounds Fourteen Shillings and Eight-pence, paid the Commonwealth, together with the Interest, and reasonable Charge. 3. To satisfy their just Debts now due to themselves, together with reasonable Interest; or a rateable Part thereof, according to the Money advanced. 4. That in case there be a Surplusage remaining, then it is to be returned to Sir Tho. Dawes, and Mr. John Dawes, proportionably. That in case any other Creditors, within Three Days after Notice, will come in, and pay their proportionable Parts towards this Sum of Twenty thousand Seven hundred and Thirteen Pounds Fourteen Shillings and Eightpence, paid the Commonwealth, and the King's Debt; then they are to be admitted, and to receive a proportionable Satisfaction out of the said Estate. That in case Sir Tho. Dawes or Mr. John Dawes, or any Friend for them, shall, within Six Months, repay unto the Creditors all such Monies as they shall advance, either to the King or to the Commonwealth, together with reasonable Interest; and either pay, or otherwise secure to their Contentment, their several Debts, with Interest; that then the Trustees, by the Act of Parliament, shall stand estated, to the Use of the said Sir Tho. Dawes, or Mr. John Dawes, or other their Friends. Provided that in case any of the said Lands shall be, within the said Six Months, offered to Sale; that then Sir Tho. Dawes and Mr. John Dawes, or one of them respectively concerned, be made acquainted therewith, or Notice left at their several Habitations, and with the just Sum which shall be offered for the same. It shall be lawful for either of them, or their Friends to their Use, to have the Refusal of the said Lands, with Advancement of the said Monies. That, of the Remainder of Thirty-one thousand Two hundred and Three Pounds Thirteen Shillings, not advanced by the Creditors, Sir John Jacob, Sir John Harrison, and the rest of the late Farmers undertake to pay, unto the Use of the Commonwealth, the just Sum of Ten thousand Four hundred Eighty-nine Pounds Eighteen Shillings and Four-pence. Whereof there is due from them, for their own Debt, over and above the Monies they have already paid, towards their Fine, the Sum of Two thousand Four hun- dred Eighty nine Pounds Eighteen Shillings and Fourpence. The other Eight thousand Pounds they are to be secured, with reasonable Interest, upon the Nineteen thousand Five hundred and Thirty Pounds Tallies, due from his Majesty, under the Estate of Sir Abra. Dawes: The Remainder of the Tallies to go unto the Creditors. WE whose Names are here-under written, Creditors of Sir Tho. Dawes, do undertake to pay in these several Sums here-under written, the Tenth Day of this present August. Sir Wm. Acton, for - - 1,500 Wm. Acton. Arthur Samwell Esquire, - 2,000 Arthur Samwell. Robert Cole Esquire, - - 1,500 Rob. Cole. William Humble Gentleman, - 1,000 Will. Humble. Francis Futter, - - - 600 Fra. Futter. Thomas Woodward Esquire - 1,000 Thomas Woodward. Stephen Aberly Grocer, - - 2,000 Stephen Aberly. Ferdinando Massom Esq; - 500 Ferdinando Marsham. Edward Bradborn, Silkman, - 150 Ed. Bradbourne. Hugh Hobert, Gentleman, - 2,500 Hugh Hubbert. Edward Wood, Gentleman, - 200 Edw. Wood. Henry Kersly, Gent. for Richard Huett, Gentlemen, 500 Hen. Kearsley, for Rich. Hewett, Gent. Robert Hayman, Gent. for Francis Warner, Esquire, 1,000 Robert Heyman. Thomas Snelgrave, for Sir Thomas Crymes, - - 1,500 Tho. Snelgrave. Thomas Carter, Joiner, - - 150 Tho. Carter. Robert Dorrington, - - 550 Ro. Dorrington. Thomas Robynson, - - 200 Thomas Robinson. John Hide - - - - 1,800 John Hide. Bartholomew Nokes, for the Lady Romney, - - 500 Barth. Nokes. Ordered, That the Committee doth think fit, that the several Sums, of Money above written shall be paid in to Sir Robert Pye, by Tuesday next: And his Receipt thereof shall be their Discharge. Ordered, That the Opinion of the Committee be reported to the House; that, in case the House doth not pass a Bill, to the Use of the Creditors of Sir Tho. Dawes, of the Lands of Sir Tho. Dawes and Sir Abraham Dawes, which descended upon Sir Tho. Dawes, or others, to reimburse them of the Monies by them advanced, for the Use of the Commonwealth, the Debt due to his Majesty, and their own just Debts, with reasonable Interest; that then the several Creditors to be repaid their several Sums of Money, by them advanced, to the Use of the Com monwealth, with their reasonable Interest, out of the Money raised by the Poll-bill. 1. Because in the King's Absence, many emergent Occasions may happen, in Parliament and otherwise, where necessarily Use may be of the King's Authority, especially in these Times, when Things are not yet fully settled. 2. Because, by all the Precedents we can find, it doth appear, when a Parliament was sitting in the King's Absence, there was a Custos Regni, or Locum tenens. 3. For to have a limited Commission to pass particular Bills, in certain Matters, wherein the Bills are not yet framed, is without any Precedent, that we can find; and may be subject to Dispute and Question, and of dangerous Consequence. Mr. Pierrepoint went up to the Lords with this Message; To desire a Conference by a Committee of both Houses, so soon as may stand with their Lordships Conveniency, concerning the Matter of the last Conference touching the Custos Regni. Mr. Glyn, Mr. Pierrepoint, Sir Jo. Colpepper, Mr. Pym, Mr. Fines, Lord Falkland, are appointed Managers of this Conference. Ordered, That the Committee for the Bill for securing the Arrears to the Scotts shall sit To-morrow Morning at Seven of Clock, in the usual Place: And Mr. Whittlock has Licence to shew to the Lord Lowdun, One of the Scotts Commissioners, the said Bill. Sir Ph. Stapleton brings Answer, that their Lordships will send Answer by Messengers of their own. With the Yeas, - - - 58. With the Noes, - - - 44. Resolved, upon the Question, That the Person of Sir Tho. Dawes shall be forthwith discharged from any farther Restraint under the Serjeant. A Message from the Lords, by J. Heath and J. 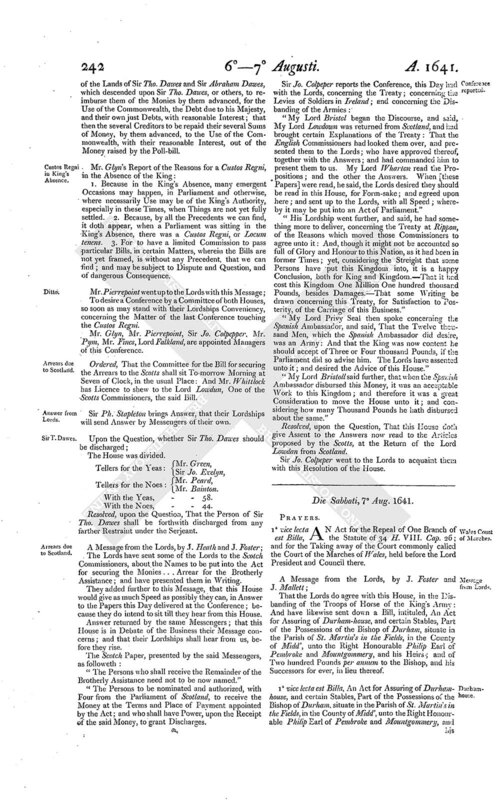 Foster; The Lords have sent some of the Lords to the Scotch Commissioners, about the Names to be put into the Act for securing the Monies ...Arrear for the Brotherly Assistance; and have presented them in Writing. They added further to this Message, that this House would give as much Speed as possibly they can, in Answer to the Papers this Day delivered at the Conference; because they do intend to sit till they hear from this House. Answer returned by the same Messengers; that this House is in Debate of the Business their Message concerns; and that their Lordships shall hear from us, before they rise. "The Persons who shall receive the Remainder of the Brotherly Assistance need not to be now named." "The Persons to be nominated and authorized, with Four from the Parliament of Scotland, to receive the Money at the Terms and Place of Payment appointed by the Act; and who shall have Power, upon the Receipt of the said Money, to grant Discharges. "My Lord Bristol began the Discourse, and said, My Lord Lowdown was returned from Scotland, and had brought certain Explanations of the Treaty: That the English Commissioners had looked them over, and presented them to the Lords; who have approved thereof, together with the Answers; and had commanded him to present them to us. My Lord Wharton read the Propositions; and the other the Answers. When [these Papers] were read, he said, the Lords desired they should be read in this House, for Form-sake; and agreed upon here; and sent up to the Lords, with all Speed; whereby it may be put into an Act of Parliament." "His Lordship went further, and said, he had something more to deliver, concerning the Treaty at Rippon, of the Reasons which moved those Commissioners to agree unto it: And, though it might not be accounted so full of Glory and Honour to this Nation, as it had been in former Times; yet, considering the Streight that some Persons have put this Kingdom into, it is a happy Conclusion, both for King and Kingdom.-That it had cost this Kingdom One Million One hundred thousand Pounds, besides Damages.-That some Writing be rawn concerning this Treaty, for Satisfaction to Posterity, of the Carriage of this Business." " My Lord Privy Seal then spoke concerning the Spanish Ambassador, and said, That the Twelve thousand Men, which the Spanish Ambassador did desire, was an Army: And that the King was now content he should accept of Three or Four thousand Pounds, if the Parliament did so advise him. The Lords have assented unto it; and desired the Advice of this House." "My Lord Bristoll said further, that when the Spanish Ambassador disbursed this Money, it was an acceptable Work to this Kingdom; and therefore it was a great Consideration to move the House unto it; and considering how many Thousand Pounds he hath disbursed about the same." Resolved, upon the Question, That this House doth give Assent to the Answers now read to the Articles proposed by the Scotts, at the Return of the Lord Lowdan from Scotland. Sir Jo. Colpeper went to the Lords to acquaint them with this Resolution of the House.